I have had an interest in supporting animal rescue for as long as I can remember. As a young child, I would save my coins until I had a substantial amount and then deposit them into the Orphans of the Storm bank at Adam's Jewelers in my hometown of Kittanning, PA.
As I have become older, my compassion for animals has continued to grow. I truly enjoy volunteering my time at Guardian Angels Pug Rescue in Latrobe, PA. Nothing makes me happier than bathing the rescue pugs. But sometimes life gets busy and the time to make a trip to Latrobe seems hard to come by. ​I knew that I needed to find another way that I could make a difference for these rescues that are near and dear to my heart. That is where my hobby of coffee roasting came in. Even though I worked a full time job as a dental hygienist, I was still able to roast a batch or two of coffee on week nights and had even more free time to do so on the weekends. I then began to wonder if people would be willing to purchase my coffee in exchange for knowing that $1 from each bag would be donated to an animal rescue. On October 28th, 2015 I launched my Etsy shop and Facebook page. Within a few minutes, I had friends supporting me by liking my page. Within the hour, I had my first few orders to fulfill! It was so exciting to see that at least a few friends and family thought my idea could be a good thing. Curly Tail Coffee's customer base continued to grow and has allowed me to donate over $10,000 to animal rescue to date. I’ve shipped CTC to every state in the United States as well as Canada, The United Kingdom, El Salvador and Australia. Most recently, Curly Tail Coffee has gone mobile and was voted Best New Food Truck 2017 by The Pittsburgh City Paper. I wasn't sure if my little business idea would be successful or not, but I'm sure glad that I gave it a shot. 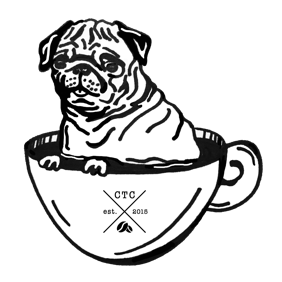 Curly Tail Coffee's name obviously comes from my love of pugs! My husband and I have three pugs and one pig of our own and each one has a roast named after them. Izzy, our nine year old and first pug. This is where the pug obsession began! Wrigley, our six year old pug mix that we adopted from a shelter in Ohio in November 2013. Sprinkles, our four year old pug that we adopted from Orphans of the Storm in May 2015. Petunia, our two year old Juliana pig that we added to our family in February 2017.